With a useful capacity of 13, 15 or 18m³, TX137 / 157 et 177XL EUROMARK big volume straw blowers are arranged to mulch important rations or big sites. They allow to load several bales, guaranteeing a great mulching autonomy.To add performance, they are available in different versions in order to suit every buildings’ configuration and all needs. Or in double chutes version (lateral chute + 320° swivelling chute). 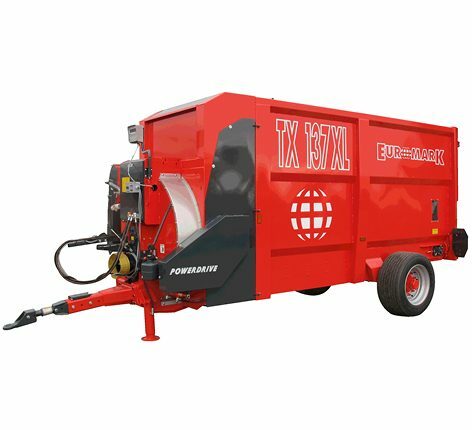 Our TX137 / 157 et 177XL straw blowers and distributors models are equipped with 3 mechanical feed rotors and benefit from S.D.E. technology. This Strung Bale Distribution ensures high quality mulch. All-fodder feed rotors are mechanically powered by a belt. With a diameter of 550mm, these rotors have cutting sections, which slice grass bale. Ejectors, spiral placed on the rotor, drive the products through the turbine. The feed rotor’s important diameter prevents long fibres from winding. A comb regulates the straw’s or the fodder’s flow into the turbine. Patented system POWERDRIVE // EUROMARK exclusive (optional) : Developing maximum power for the feed rotor, this flow system with hydraulic disengaging belt enables the separation between the turbine’s and the feed rotor’s rotation, and the belt’s movement. EUROMARK exclusive patent.